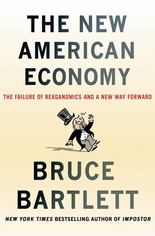 As a domestic policy advisor to Ronald Reagan, Bruce Bartlett was one of the originators of Reaganomics, the supply-side economic theory that conservatives have clung to for decades. In The New American Economy, Bartlett goes back to the economic roots that made Impostor a bestseller and abandons conservative dogma to seek a policy simply based on what’s worked in the past. Marshalling compelling history and economics, he explains how economic theories that may be perfectly valid at one moment in time, under one set of circumstances, tend to lose validity over time because they are misapplied under different circumstances. Bartlett makes a compelling, historically-based case for large tax increases, once anathema to him and his economic allies. In The New American Economy, Bartlett seeks to clarify a compelling and way forward for the American (and global) economy.